Designed for use in the harshest environments, the AP 5181 Outdoor Access Point offers the cost-effective, secure and safe extension of the corporate network in outdoor areas, such as expansive yards, as well as in the hazardous environments commonly found in the petrochemical, oil and gas, utilities industries. Extend high performance wireless voice and data services beyond and between buildings — without the expense of installing additional cable or fiber. Support for wireless mesh enables the connection of two wired networks, simplifying the creation of complex multi-node, multi-link networks. 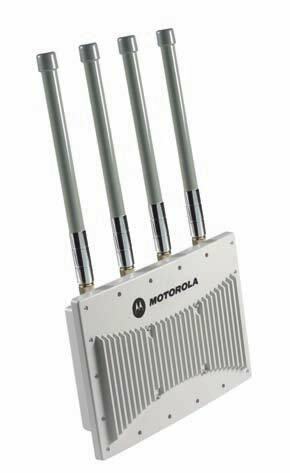 Reduce your network costs yet expand your network reach — with Motorola’s AP 5181 Outdoor Access Point. Designed to withstand wind, rain, and extreme temperatures. Operates in temperatures from -30° C to 55° C (-22° F to 131° F). Self-assembling, self-healing nodes automatically establish wireless links between APs; install nodes wherever there is power, without installing cable or fiber. Simultaneous support of 802.11a/b/g; works with any standards-based IEEE WLAN device. No need to install extra hardware; easy to scale, upgrade and maintain. Integrated services for authentication and public access management. Superior performance for demanding mission-critical applications, including voice and video. Can be controlled with a wireless switch to enable central management from the NOC, and in the event of loss of connectivity, resumes functionality as a standalone access point. Engineered for safe use in hazardous environments commonly found in the petrochemical, oil and gas, and aerospace and utilities industries.